A number of probable reasons for beak deformities have been suggested, but in many cases exact causes are unknown in the UK and Ireland. Exposure to environmental contaminants, such as industrial pollutants, insecticides, herbicides and fungicides, have been implicated with beak deformities but evidence to support this more widely is not well established. Contaminated bird food has also been implicated but this remains unsubstantiated. Alternatively, physical trauma (e.g. 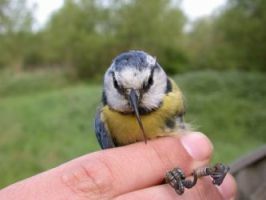 due to a collision) to the beak is a possibility, although research – which is now somewhat dated – suggests that this is not a major factor. Nutritional deficiencies could lead to beak abnormalities. In isolation, some human-provided foods are unlikely to provide a complete diet and can differ in texture compared with natural alternatives, perhaps causing differences in patterns of beak abrasion. For example, in some captive raptors where the tips of the upper and lower mandibles do not oppose each other, beaks can overgrow if individuals are not provided bones at which to pick. Beak deformities could be influenced by disease or may be inherited genetically and while research continues to investigate these possibilities, current evidence is not comprehensive. For an insight into 'Avian Keratin Disorder' - a possible cause of many beak abnormalities - see Tim Harrison and Colleen Handel's article in Bird Table.